Publication: November 26th 2013 by Harlequin Teen. Where to begin? 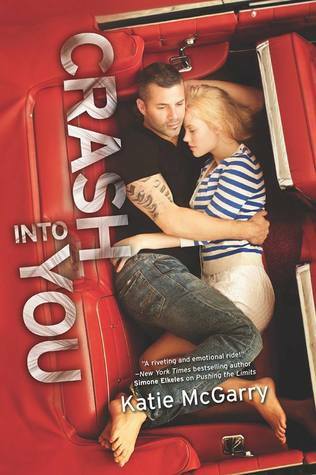 If you haven’t read Katie McGarry’s other books from The Pushing the Limit series and you like YA then you should check them out. You could read this without reading the other books first but you would be better off in understanding Isaiah if you read the others first. I love her understanding of teenagers. It made me remember my high school days. The only thing I didn’t like was the constant F bomb. I didn’t like it in high school either. Isaiah is a teddy bear on the inside. He just looks all tough with his tattoo and piercings on the outside. Katie McGarry did a great thing showing how just because someone is covered in tattoos and stuff doesn’t mean they are a punk or whatever. He has had a messed up life living in the foster care system since his mom went to prison when he was little. His mom is out now and Isaiah has some bitterness towards her. Isaiah’s social worker is really good and tries to get them to talk. Isaiah wants none of his mom’s excuses of why she has been out for two years and hasn’t tried to contact him in those two years. Isaiah is finishing school in a work program with mechanics and is working on his certification to get him somewhere in life after school. He is smart and knows his stuff. People don’t mess with Isaiah. He is tough and fierce, loyal and protective of those he cares about. He fixes cars and knows how to soup them up for races. He is currently lying to his social worker because he is living with his roommate ,Noah, in a slum apartment and not with his foster family. He needs money to pay the rent. He decides to check out how he could get some when he goes to some illegal race where Eric runs the neighborhood. While there he runs into a girl who obviously comes from money and shouldn’t be there. Isaiah realizes she needs help if she is to get out unscathed. The police show up and it is every man for himself to get out and not get caught. Isaiah sees that this girl, Rachel, doesn’t move and helps her escape. This scene is wild and there is racing with some crazy driving and maneuvers. At one point, when they ditch the cars,he pins her against a wall because the police are looking for anyone from the race,, and tells her to kiss him to pretend they are just a couple hanging out. Rachel doesn’t know what to do because she has never kissed anyone before. So, when Rachel and Isaiah learn that Eric’s money from the races was stolen and he thinks Rachel took it and if she doesn’t come up with the money, Eric will take matter into his own hands. That is not a good thing. In fact it could be deadly. Two other rich kids who had shown up at the race were in the hospital. So Isaiah steps up and helps her. Oh, I forgot to mention that Rachel showed up at the race because she loves cars, knows everything about them and owns a hot car herself that she wanted to race. Well now she just may see that car race. It just might not be her racing it. Isaiah and Rachel rush to find ways to race and earn the money back. The problem is that Eric put out the word not to help them or else! Now it is a race against time to find the money without Rachels family finding out; Without Rachel’s brother finding out about Isaiah; Without Isaiah’s social worker finding out; Without losing Isaiah’s apartment (he has to make money for that too); Without Rachel having panic attacks that cripple her; Without telling some people because you don’t want to burden them; and without losing their hearts in the process. This is a fast paced story that keeps you on your toes. I could hardly put it down. It is constant action. When I got to 80% of my book, I was thinking that there was no way this story could have all the problems solved by the end, but it does and it’s a great ending. It is realistic! It tugs at your heart strings and gets your adrenaline pumping at the same time. As a mom, I wondered if I would have done the same as Rachel’s? I enjoyed how the social worker for Isaiah is a good person and doesn’t make it seem like the system doesn’t work at all. There are good people out there too. This story is very raw and real. It is intense and deals with so many issues that teenagers face. It shows the growth they can have too! It shows that families aren’t perfect. Everyone has issues to deal with. I also liked how you have to learn to let go sometimes. I'm so glad you loved this. I am starting it soon to and I can't wait. Great review! !